In cold worked steels, failures can be broadly categorized in two categories. The first, are those nucleated by localized defects- such as seams, pipe, and exogenous inclusions. The second, are those which result from exceeding the strength of the material itself. 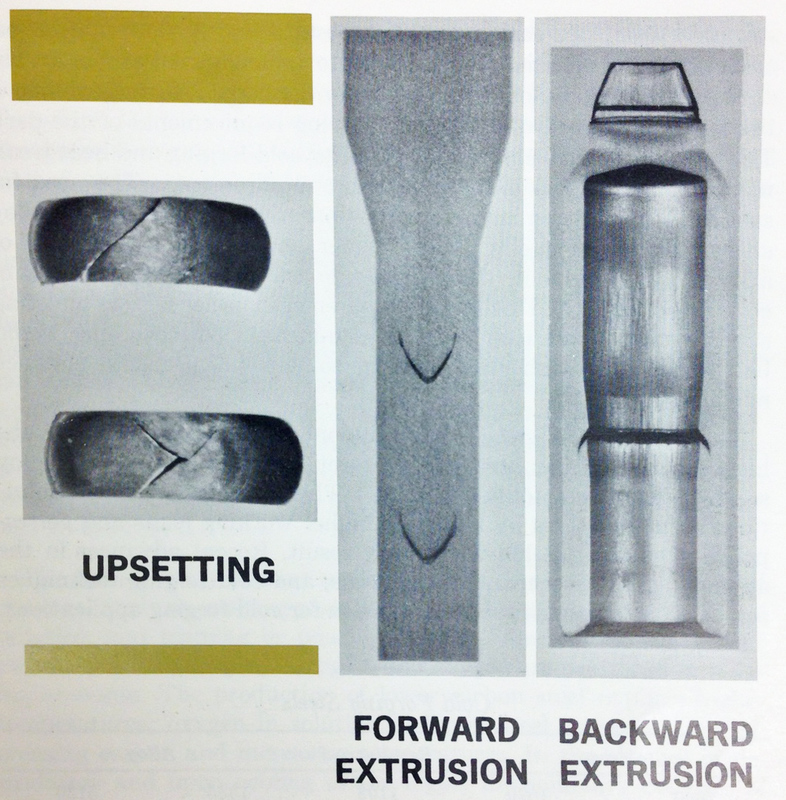 The compressive stresses of cold working results in failures by shear along planes 45 degrees to the applied stress. These are known as shear failures. The presence of shear failures in an otherwise metallurgically normal material indicates excessive mechanical deformation. While often the result of tooling issues, conditions which lower material ductility including chemistry, macrostructure, nonmetallics, microstructure, aging, and hydrogen embrittlement have also been implicated in investigations of premature shear failure. Typical shear failures in cold forming. This post will focus on the central Bursts in the product of cold drawn steel, especially from the point of view of a shop making parts on automated equipment. Ignoring the steel factors that may play a role in triggering the central bursts or chevrons, the role of tooling is usually considered to be the root cause, as replacement of dies typically eliminates the central bursting. A bar which exhibited central bursting was saw cut lengthwise to show the internal ruptures. Presence of a wear ring in the cold drawing die results in forces greater than steel’s strength causing bursting in the core. 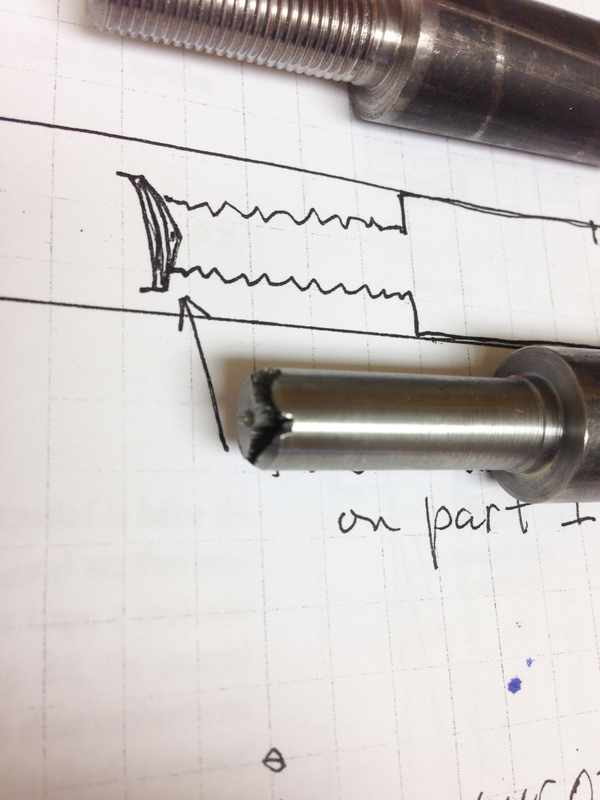 In very rare cases, while machining parts from a bar which exhibits internal bursts or chevrons, the part will separate from the bar in process because of the prior existing rupture. The photo below shows such a part, note the fracture surface on the sides of the stepped down diameter on the part end shown in the photo below. Note prior existing rough fracture surface on stepped down diameter. This is remnant of prior existing central burst in the bar. 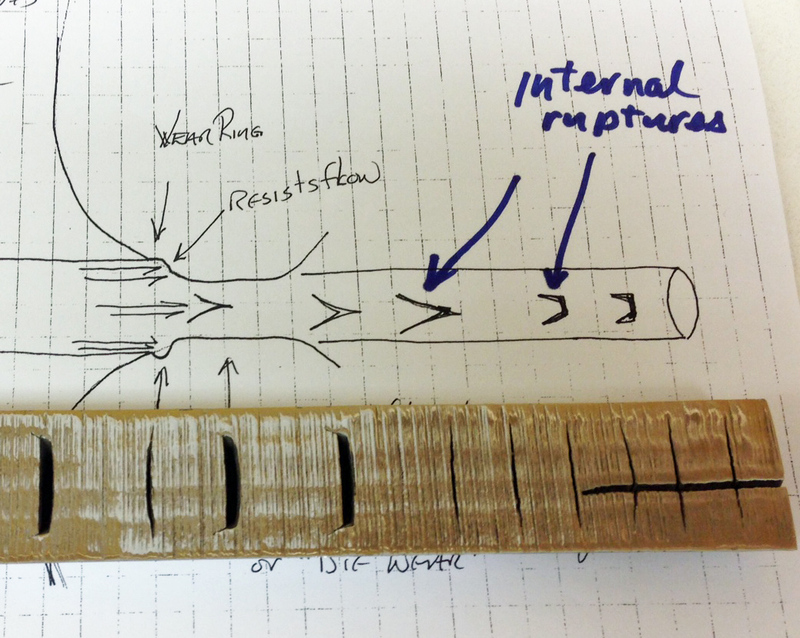 The following two photos show how the internal bursts could have been manifested in the original bar as well as the parts. This figure shows how the prior existing ruptures could have existed in the bar as they are seen on the parts off the automatic screw machine. 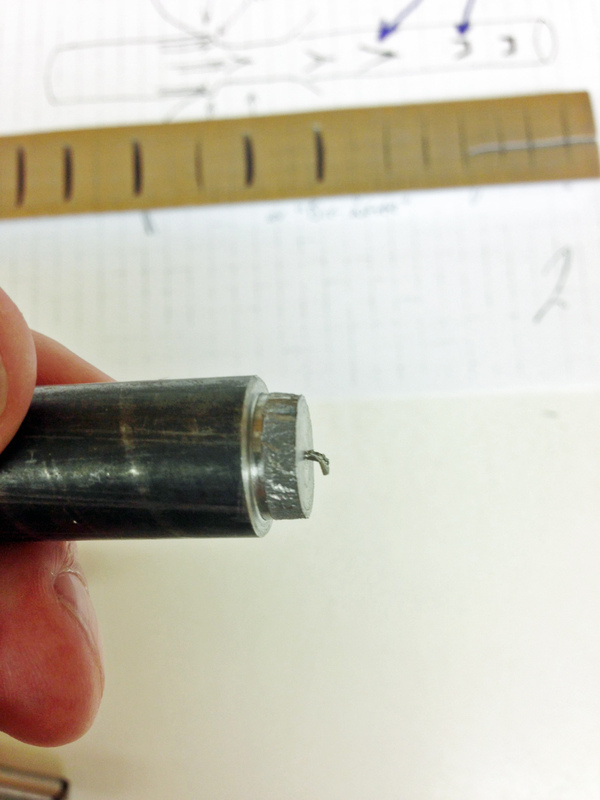 It is difficult to see the defect on the threaded end of the nearly completed part, but this photo does attempt to show that. 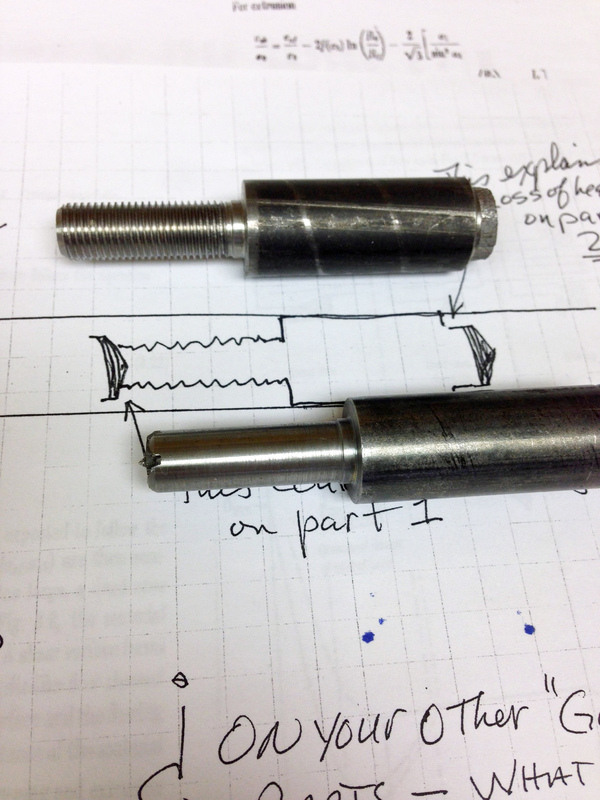 On this part the central burst or chevron was encountered at the threaded end of the part. In a later post we will discuss more factors relating to central bursting or chevron failures of cold drawn or cold extruded steel. 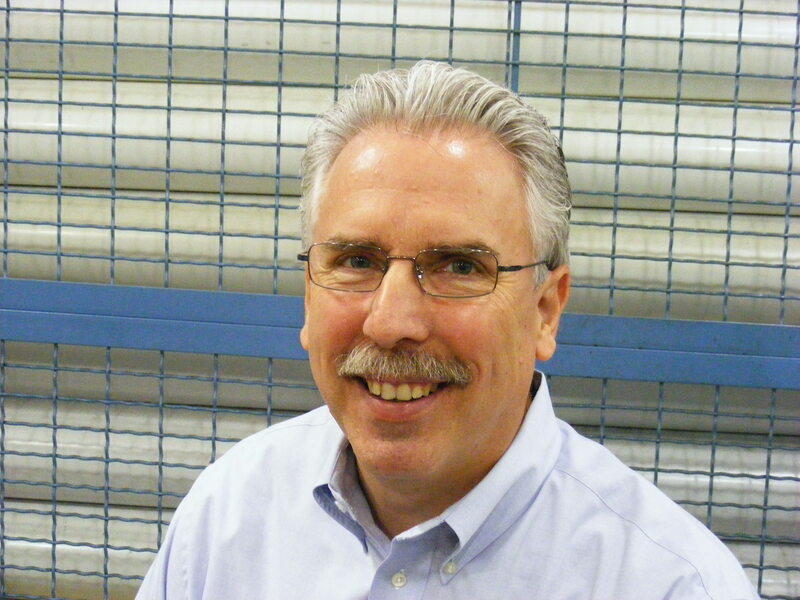 This entry was posted on Wednesday, March 26th, 2014 at 3:42 pm and is filed under Engineering, Shop Floor. You can follow any responses to this entry through the RSS 2.0 feed. You can leave a response, or trackback from your own site.